Despite the last name of “Brogan” I have never been to Ireland and with my preference for Latin countries I never had any intention to visit any time soon. However, life had other plans for me and so when an opportunity for work came up just outside Dublin I decided to stay for a week and see what the fuss was all about. Luckily my first experience was staying in Bansha Castle and it was exactly what I needed to get into good spirits. I was not happy about the constant rain but with fireplaces it was really cozy and I could have spent much more time there. Everyone raves about Dublin so I stayed a few extra days to discover Dublin shooting only with my phone. I had hoped the rain would stop but it seemed that was not in the cards for me. And I figured I could complain about it or just get outside and see the city. 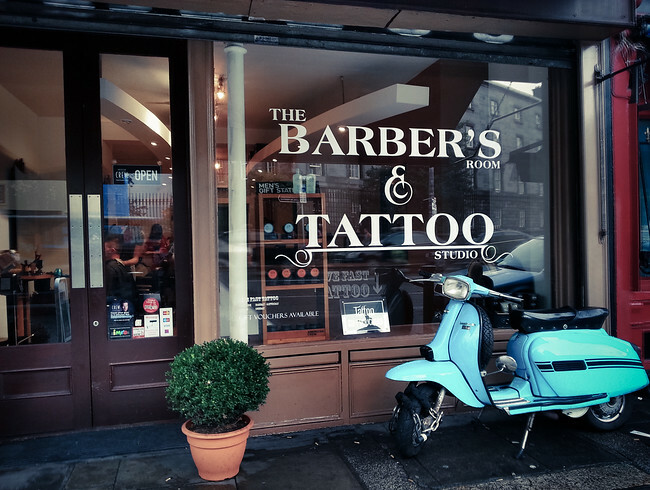 First thing out the door was this tattoo and barber shop, odd combination but the hipster in me really likes it. The rain stopped and while it was cloudy it was actually a nice autumn day and as The Book of Kells is on the “must-do” list in Dublin I headed over to see it. 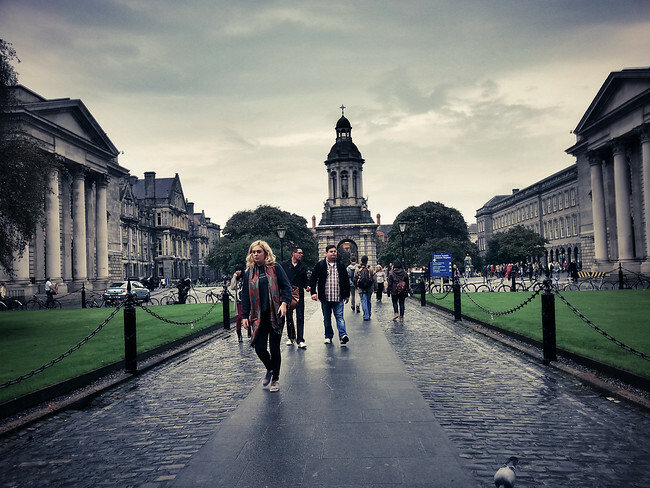 Trinity College itself is quite lovely, but when I saw the line-up I spun on my boot heels. Sorry but I’m not waiting in line for an hour to look at a book – next time Dublin. Finally the sun came out! 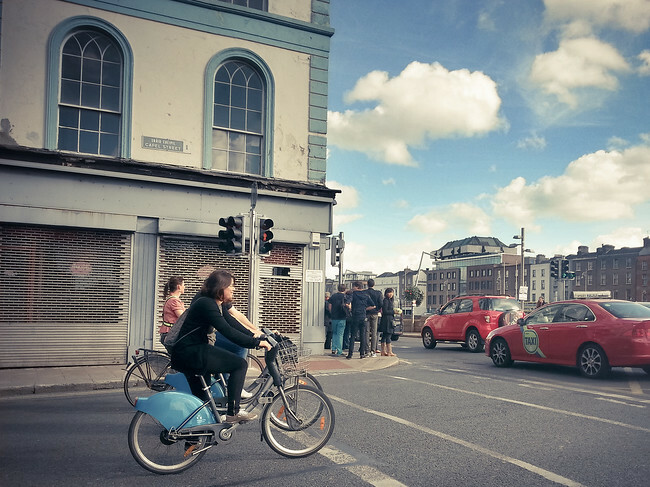 The city is quite walkable and so I spent much of it wandering the streets and Dublin started to grow on me. 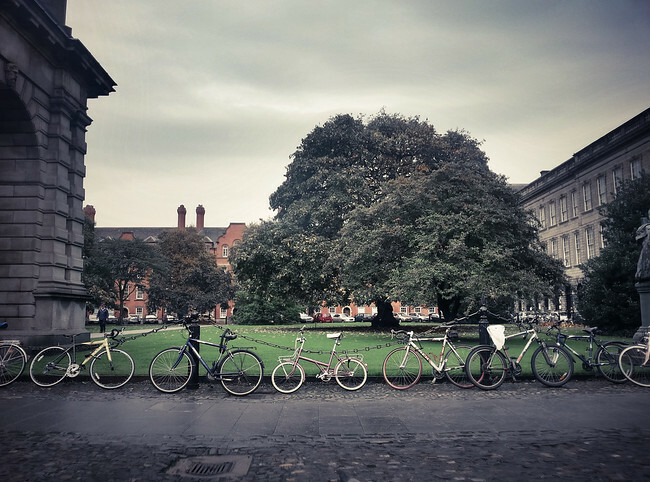 But a week was not nearly enough time, I didn’t fall in love with Dublin nor feel a connection to my ancestors but I did decide that I would return to discover more of why everyone loves Ireland. Despite living just a few hundred miles east of the Irish Sea, I still haven’t made it to Ireland. The photos are lovely, especially the bikes on the fence photo Ayngelina! So much hinges on the weather, doesn’t it? I had beautiful weather during my time in Ireland, but that was even too hot for the Irish. The front page of the paper one day had the headline, ‘Students suffer during their exams in 24 degree heat’. So many Irish will tell you “Dublin isn’t Ireland”. I spent 10 days touring around the country two years ago and my favourite spot was Galway. It’s only a 2hr drive from Dublin but smaller and more interesting. It’s definitely worth coming back and checking out some other towns besides the capital. You can’t even photograph the College Library. Which is shame, because it’s absolutely gorgeous, but such a waste of time for us bloggers! You shot these with your PHONE!!? 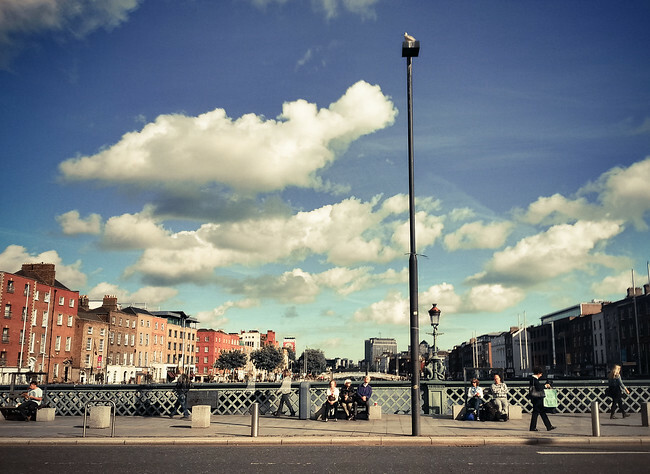 By judging with your photos, Dublin looks gorgeous. I have been reading a lot about Ireland, looking forward to be there soon. Nice shots! I wish I’d come to TBEX in Dublin. Needless to say, a city I’ll still visit someday. Beautiful pictures! 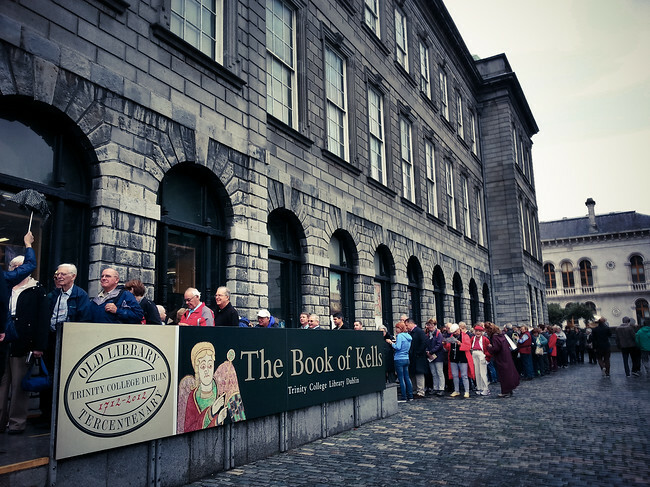 That line up for the Book of Kells is insanely long. I think we were extremely lucky to be able to go straight in when we were there – no queues! I´ve always been a bit sceptical about Ireland and all the praise, but then after another one of my friends got back from there and there was no way to stop his overexcited rant about Dublin and Ireland I decided it was time to explore the stereotype about the friendliest people in the world on my own..Well, and the result? Let´s just say that all the praise is deserved. Cab driving has become my new hobby while in Dublin..Irish cab drivers are the most chatty people in the world, I swear! I´ve heard everything..from the Irish history to family anecdotes:)You just feel good in Ireland, welcome.. I absolutely love your photos. Did anything during your travels inspire you? I’m always interested to hear about what makes people tick and want to book their next flight. Your photos sure inspired me, thanks for sharing! For me it’s about understanding how others live, it’s why I’d rather spend an afternoon in a cafe than a museum. Truth: I don’t like Dublin at all. I’ve been there at least five times over the past 10 years and just am not impressed. Now the rest of Ireland? Love, adore, want to move there. So many people have told me that Dublin is not like the rest of Ireland, which makes me think I need to come back and explore a bit more! Great photos with your phone. If you want to see ‘real’ Ireland then you have to head to the west coast. This is by far the most beautiful and captivating.